The app we have created called CyBye, an app that helps kids learn about cyber bulling. You have a mission to save planet CyBye. You are a little pink fuzzy creature named what ever you like. 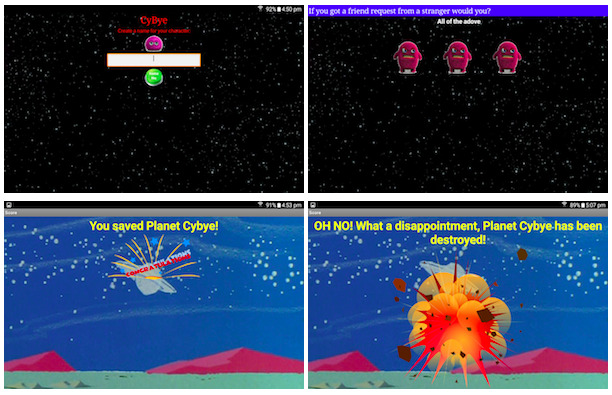 You are welcomed into planet CyBye and you find it is being attacked by bully monsters. The way to get rid of the bully monsters is to answer the cyber related questions and take the bully monsters by surprise! We have created a scoring system so you can see if you need to learn more about cyber safety or if your a cyberwise genius!